The PS300 High Voltage Power Supply series consists of three efficient, microprocessor-controlled, switching DC power supplies capable of delivering 25 W of output power at voltages up to 5 kV. 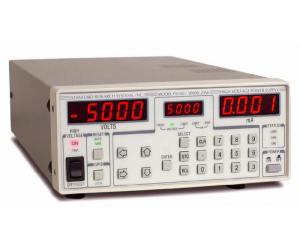 All models have 0.001 % regulation and 0.05 % accuracy, and the output voltage can be adjusted with 1 V resolution over the entire operating range. All PS300 series supplies have rear-panel SHV connectors. Optional cables allow connection with standard high-voltage connectors (SHV or MHV). A three-position, high-voltage enable switch on the front panel prevents the high voltage from being turned on under computer control unless the switch has been manually armed. A highly visible red LED always indicates when the high voltage is on. Convenient front-panel LED displays indicate both the voltage and current delivered to the load at all times.